Posh striker Junior Morias is in the running for a first-team call-up. Peterborough United manager Grant McCann is likely to freshen up his starting line-up for the League One visit of Shrewsbury to the ABAX Stadium tomorrow (February 14, 7.45pm kick off). Striker Paul Taylor and midfielder Leo Da Silva Lopes trained today after missing Saturday’s last-gasp defeat at home to Sheffield United. Striker Junior Morias, captain Chris Forrester and left-back Andrew Hughes are also in contention for a start after starting the Blades game on the substitutes’ bench. Paul Taylor has recovered from illness. McCann is desperately seeking a formula for success at home. 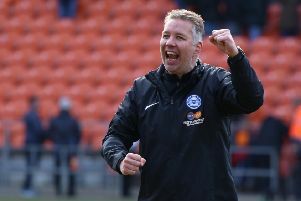 Posh have won just five of 15 League One matches at the ABAX ahead of a match against the division’s most in-form side. Shrewsbury became the first team to win a League One match at Scunthorpe for 14 months on Saturday. That was a fourth win in six unbeaten game for the Shrews. “I don’t believe in making too many changes as it causes too much disruption,” McCann stated. “But I do believe in freshening things up from time to time. “Leo was rested on Saturday. It was a mental thing rather than a physical one. I might give him another game off. Posh midfielder Leo Da Silva Lopes is back in training. “Paul Taylor was ill on Saturday, but he’s fine now. It won’t be a 12-man game between now and the end of the season it will be a 17-18 man game. “I was pleased with the attitude and application of the players against Sheffield United. When I watched the game back, it was a better performance than I thought. We were just missing an end product. “We’ve done a lot of work on that part of our game, but it’s taking time. Craig Mackail-Smith has only just arrived in the building and Junior is doing well, but he’s new to this level. “It’s a tough game tomorrow. Shrewsbury are in great form and their win at Scunthorpe was impressive. I will give them all due respect, but I need to concentrate on my team. “I want us to stamp our authority on the game from the start. We need to be on the front foot from kick off and play with plenty of aggression. “We have 16 games left, 16 cup finals if you want, and I’m actually quite pleased with where we are. Michael Bostwick remains on the sidelines for Posh as do long-term injury victims Jermaine and Harry Anderson. The latter is only a week from a full recovery.